Chronic has been sentenced for euthanasia. Not because he bit someone, but because he ran out of his yard twice, and he did not wear a muzzle!! This should at the most give you a fine NOT euthanasia. At this point in time there is no precedent for multiple infractions of this injunction. As most of you in our dog community are aware of, another dog has been taken, even though it didn't do anything other, than to run outside the fence to great another dog. There has been 2 situations, respectively in October and Novermber 2011. Both times the gate had not been secured good enough, but the fence is legal, because it's 2m high. Both times he ran out to greet the same dog. 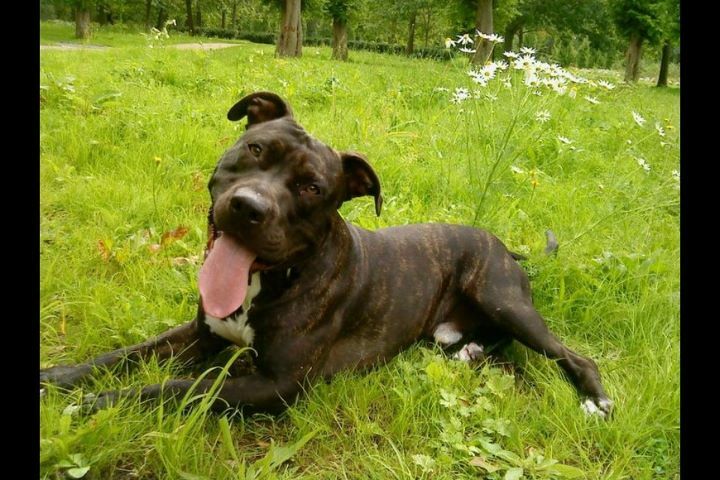 Then what happens, is that the owner of the other dog contacts the police, and claims that Chronic has bitten her dog. Neither of the times have the owners of Chronic noticed any bites, the dog seems normal and comes happily up to great the owners of Chronic, and likewise there has been no notice from the insurance company, where you would normally send the bill do to bites. I would assume, that even with a small bite you would go to the vet, to get medication against any infections etc. Both times by the way, it's the same story: that it ran out of the gate and unprovoked bit her dog. The first time on the side, and the second time in the head, but the problem is that there are no damages, and no mention of mauling and it's only mauling that would cause the dog to be euthanized. If it's only about some nicks, then a vast majority of the dogs where I live would have to be euthanized, because folks don't have control of them, and no it's not the banned breeds, it's labradors, shepherds, danish swedish terrier etc., but I don't hate them for that reason, and I know for sure that the police don't do anything about it in my area. Regardless, the police choose to react, sending a notice where it stated the injunction to wear a muzzle and leash, due to the incident, but at no time did they write that they would come and take the dog. 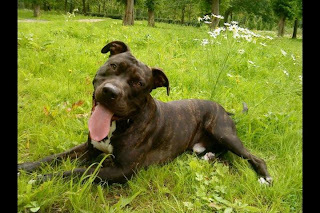 It states in the law already, that since he is an american staffordshire terrier, he must wear a muzzle and a leash being walked, but it IS an accident that he runs out of the yard, and he is not the only dog in Denmark who has done that. Unfortunately this labrador killed the other dog. Furthermore the police have NOT contacted the owners about wanting to pick Chronic up. They just showed up and picked him up, and the owners weren't even home, when they picked him up. This means, that she did not even have the possibility to prove her dogs innocence regarding the bite. That's why we have the law of coercive measures. Chronic is of no danger to himself or others, and therefore does not belong under the category, where they can just seize him. IN ADDITION, I find it DEEPLY disturbing, that the police creates a case without evidence, and decide to pick him up. Are you know to be judged in Denmark without proof?? Is the police to be outside the law and make stuff up? That it happens so many months after, should make people wonder.